Commission I is concerned with the design, construction, characterisation, calibration and use of imaging and non-imaging sensors, sensor systems and sensor networks for photogrammetry, remote sensing and spatial information science, such as air- and space-borne digital cameras and laser scanners, and thermal, hyperspectral and radar sensors. Commission I investigates the different platforms for data acquisition, including (but not restricted to) unmanned aircraft systems, mobile mapping systems, aircrafts, satellites including small satellites, and satellite constellations and cooperates with the related industry. Commission II deals with the theory and application of extracting and analysing spatio-temporal information of objects from terrestrial, aerial and satellite images, image sequences and point clouds using approaches from photogrammetry, image analysis, computer vision and machine learning, with emphasis on accurate and reliable geometric information. Applications comprise of image-based 3D measurement in geospatial data acquisition, extra-terrestrial mapping, engineering and industrial metrology, heritage recording, forensic analysis, robotics, driver assistance systems, surveillance, medical applications and other fields. Commission II cooperates with international societies in computer and machine vision and related industry and is the point of contact for CIPA. Commission III is concerned with research, development, investigation and operational use of methods and systems for the analysis of remotely sensed observations of the Earth from air- and space-borne sensors, in synergy with in situ and hand held measurements, such as physical modelling of electromagnetic radiation, the analysis of spectral signatures, image classification, data fusion and pattern recognition. Applications dealt with in Commission III comprise of environmental monitoring for sustainable development and global change; mapping of human and natural activities including land cover, land use and biodiversity; physical and empirically based process monitoring; assessing and mitigating disasters; identifying and assessing renewable and non-renewable resources; and monitoring temporal changes in weather, land and sea cover. Commission III cooperates intensively with national space agencies and is the point of contact for ICORSE. Commission IV deals with theoretical and practical aspects of the modelling, management, analysis, dissemination and visualisation of spatial and spatio-temporal data, including interoperability, web services and geospatial data infrastructure. Commission IV is concerned with applications and operational use of spatio-temporal information in areas such as environmental monitoring, disaster management, mobility, 3D city models, Building Information Systems, social media, location based services and health. Commission IV also provides links to international bodies such as UN-GGIM, ISO and OGC and to National Mapping and Cadastre Agencies. Commission V deals with education, training, capacity building and outreach in all areas related to ISPRS. It is also the home Commission for the ISPRS Student Consortium. In carrying out its tasks, Commission V cooperates intensively with Commissions I - IV and with other international geospatial societies. The ISPRS Foundation (TIF) is very pleased to announce for the first time the IGI Africa Ambassador Award. Please find below the description of the award. Have in mind, that the deadline for applications is August 31st, 2015, 24.00 CET. All incoming applications are carefully reviewed and proven for eligibility. IGI – Integrated Geospatial Innovations, Kreuztal, Germany is an innovative German vendor of photogrammetric hardware, software and workflows. IGI is very pleased to offer the IGI Ambassador Award via The ISPRS Foundation (TIF) to young scientists in photogrammetry and laser scanning coming from regionally under-represented African countries in the geospatial sciences and technology fields. The award allows for visits at IGI‘s Central Office, Kreuztal, Germany, and active participation at ISPRS Workshops, Conferences, and Symposia. It is expected, that the recipients will prepare comprehensive reports about all stations of this award to be published at IGI and ISPRS/TIF Websites and Brochures. Furthermore, they will become an IGI ambassador related to all IGI products and workflows. ISPRS Foundation Operations Officer: j.trinder@unsw.edu.au. The ISPRS Foundation (TIF) offers travel grants for most of the ISPRS Workshops, Symposia and Conferences. A very successful conference PIA-HRIGI was held in Munich, March 25-27 – please find enclosed the reports of four of the TIF Travel Grant Recipients. The deadline for papers to be submitted for full-paper review is Nov. 30, 2015, the abstract deadline is 13 December, 2015. Côte d’Ivoire Géomatique is a non-governmental organisation devoted to the development of Geomatics activities in the West African state of Ivory Coast/Côte d’Ivoire and international cooperation for the advancement in geographical information system and remote sensing and their applications. The Society operates without any discrimination. Stimulating the formation and research in GIS and Remote Sensing. Holding national and international Symposia and Congresses. Ensuring national circulation of the records of discussion and the results of research by publication in GIS and Remote Sensing. Encouraging the publication and exchange of scientific papers and journals. Encouraging data exchange and interoperability. The U.V. Helava Award, sponsored by Elsevier B.V. and Leica Geosystems AG, is a prestigious ISPRS Award, which is presented every four years at the ISPRS Congress. It encourages submission of high quality scientific papers to the ISPRS Journal of Photogrammetry and Remote Sensing. The fifth U.V. Helava Award will be presented at the 23th ISPRS Congress in Prague, 12-19 July 2016. The ISPRS Prizes for Best Papers by Young Authors recognises high quality papers presented to the Congress, see http://www.isprs.org/society/awards.aspx. To be eligible, authors must be under 35 years of age. The deadline for submission of the full paper has recently been changed and is now 30th November, 2015. 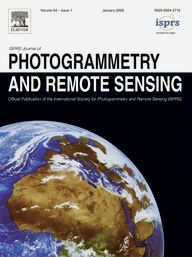 After the ISPRS Archives where accepted for inclusion into Thomson Reuters' Conference Citation Proceedings Index (CPCI), one of the indices of the Web of Science, in August 2014, it was more a question of time, when the ISPRS Annals of the Photogrammetry, Remote Sensing and Spatial Information Sciences would follow. This is now the case! With the installation of officers at the IGTF 2015 - ASPRS Annual Conference in May, E. Lynn Usery moves into the position of ASPRS President; Charles Toth, President of ISPRS Commission I, becomes President-Elect, and Stewart Walker becomes Past President. Rebecca Morton won the election to become ASPRS Vice President for 2015. Determine modalities for the periodic review of the implementation of a post-2015 framework for disaster risk reduction. ISPRS 1st Vice President Orhan Altan is one of the co-authors of the paper "Pool knowledge to stem losses from disasters", an excellent output of the work of the ad-hoc group on disaster risk assessment of the ICSU GeoUnions. The newly established ISPRS Geospatial Week will start in less than 3 months. More than 300 papers have been accepted for the 11 events of the Week. Elmar Eisemann (TU Delft, The Netherlands). The workshop will bring together experts and users of these technologies and solutions to discuss recent developments and present the latest results. 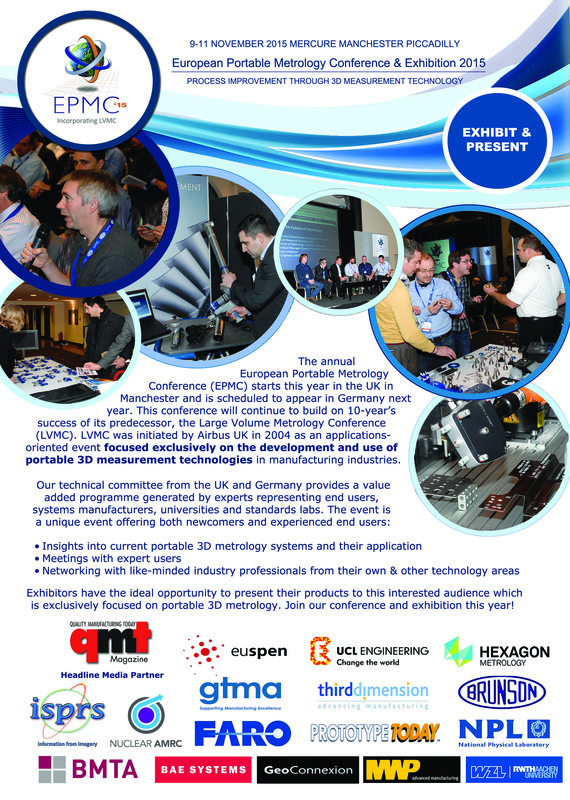 EPMC is a unique event dedicated to portable and large volume 3D measurement technologies and precision dimensional measurement solutions for manufacturers. The event is featuring a large exhibitor workshop together with technical presentations. The event will give you the opportunity to learn about the latest developments in large volume and portable metrology, automation in metrology applications, novel and unusual adaptations and applications of existing metrology technologies, new developments, etc. The second edition of the FOSS4G-Europe Conference will be held at Politecnico di Milano in Como, Italy, from July 15th to 17th, 2015. A day of workshops will precede the conference on 14th July, and a code sprint will close the event on 18th July. The Conference aims to bring together FOSS4G users and developers worldwide and foster closer interactions with and amongst European communities in order to share ideas for improving geodata, software and applications openness. The International Workshop on Supporting Future Earth with Global Geo-information, jointly organized by NASG, NGCC, Chinese National Committee for Future Earth, LIESMAR Wuhan University and UN-SPIDER Beijing Office, was held on June 9-10, 2015 in Beijing with great success. The IJGI Special Issue on "Efficient Capturing of 3D Objects at a National Level: With a Focus on Buildings and Infrastructure" offers a means to publish papers focusing on data capture methodologies (e.g., LiDAR, aerial photogrammetry, terrestrial laser scanning, existing 2D data), generation of 3D topological models, efficient 3D object capture methodologies for very large areas (e.g., national coverage), validation of generated 3D objects, consistency of the generated 3D data with the original 3D source in case of updates, maintenance of very large 3D data sets in data base management systems, initial data capture versus incremental update of existing national (3D) models, minimum 3D modeling requirements of National Mapping Agencies (NMAs) and other relevant governmental mapping organizations. Holloway, Paul, Miller, Jennifer A.
Lee, EunSu, Oduor, Peter G.
Aye, Zar Chi, Jaboyedoff, Michel, Derron, Marc-Henri, van Westen, Cees J.